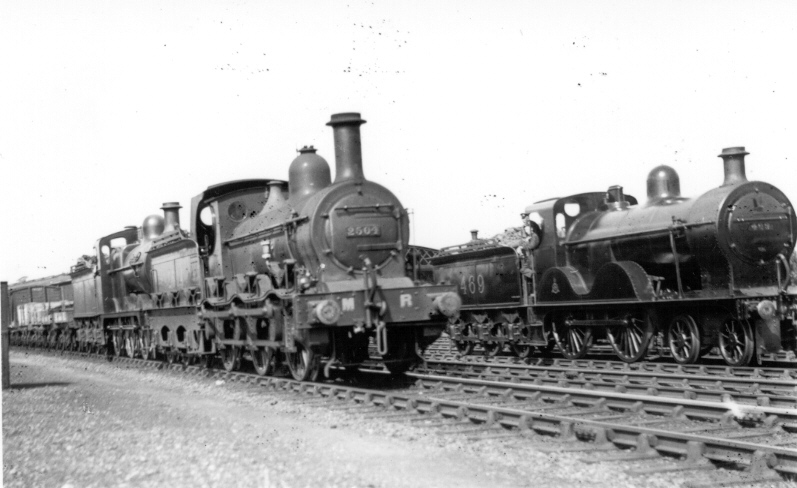 Below are a selection of photographs taken from the Midland Railway Society collection. If you feel you have anything to add to the captions, or that we have got our facts wrong, then please email the webmaster at webmaster@midlandrailwaysociety.org.uk with your comments. All images may be reproduced for non commercial purposes upon request to webmaster@midlandrailwaysociety.org.uk and must be acknowledged as being from the collection of the Midland Railway Society. 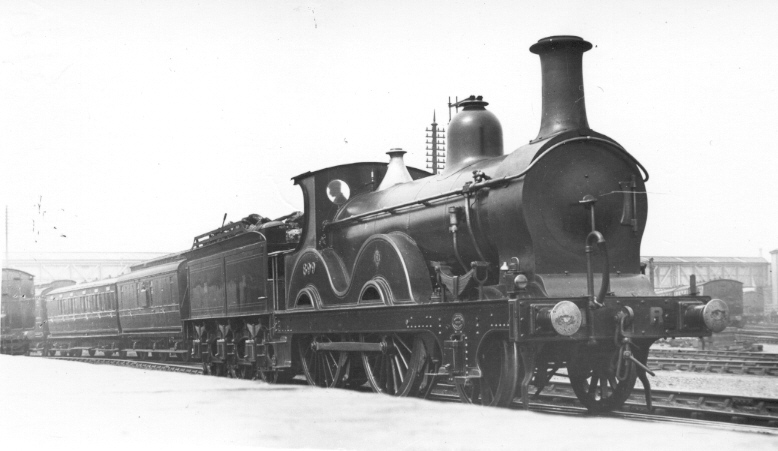 Johnson ‘1738’ class 4–4–0 No. 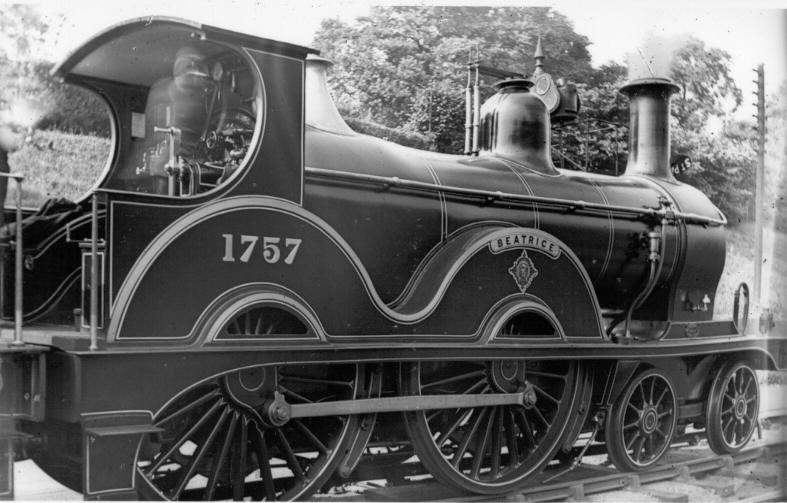 1757 “Beatrice” in fully lined livery. “Beatrice” was completed in 1886 and was exhibited at the Royal Jubilee Exhibition at Saltaire held in 1887. 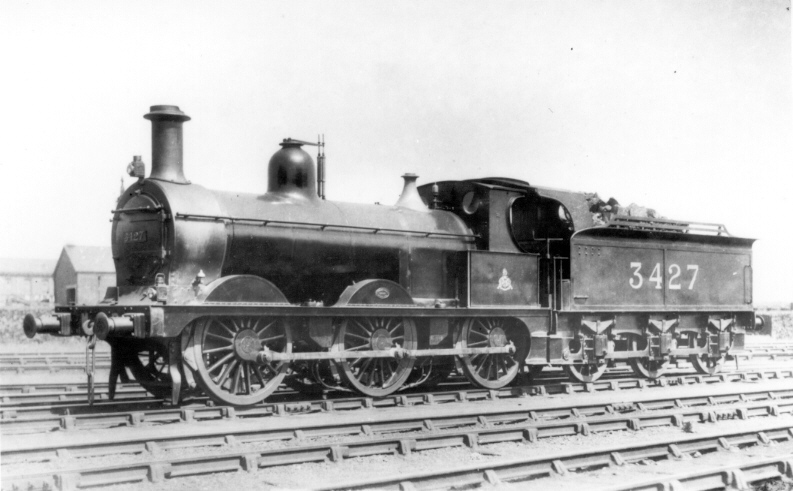 Johnson ‘J2’ class 0–6–0 No. 3427 built by Dubs in 1892 at Bedford in June 1922 fitted with a large tender cab. 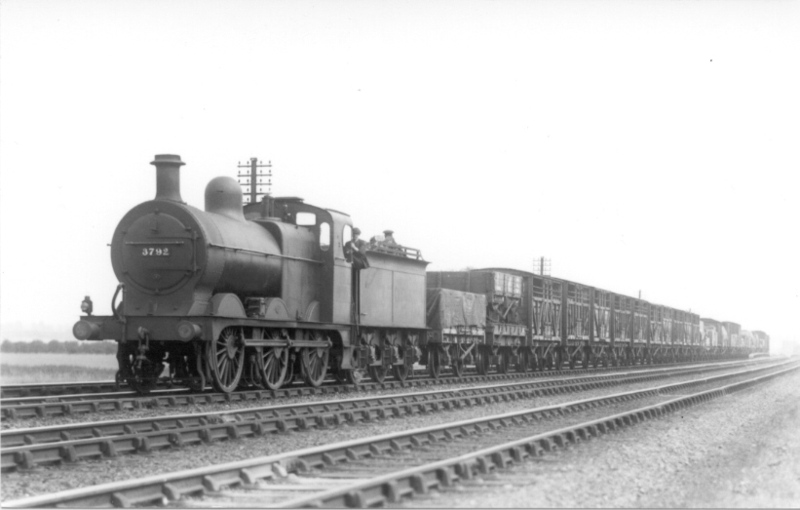 Johnson 0–6–0 No.3626 outside Wellingborough No.1 shed in October 1922. The locomotive was built in 1900 as a member of the ’M' class and survived until 1929. Note ‘target’ board ‘4’ on top lamp bracket which probably denotes a trip working. Midland Railway ‘2736’ class 0–6–0 goods No. 3768 in lined crimson lake livery at Nottingham(?). Note the express passenger train headlamps, fluted coupling rods and burnished smokebox door. The locomotive was re-built with a G7 boiler in 1922. A down (?) goods hauled by a Class 3 0–6–0 goods engine approaching Loughborough. The lengthy goods train contains several interesting vehicles including the second vehicle which is a carriage truck loaded with a three-plank goods wagon. This is followed by ten MR/LNWR cattle trucks and a variety of sheeted and covered goods wagons. The locomotive was built at Derby in 1904 as number 262, a member of the ‘2736’ class with an ‘H’ boiler. It was re-numbered as 3792 under the 1907 scheme. At the beginning of 1923 it was one of three ‘H’/‘H1’ boilered to be re-built with superheated G7S boiler, possibly as an experiment. It is shown here in this condition with extended smokebox and mechanical lubricator between leading and middle splashers. 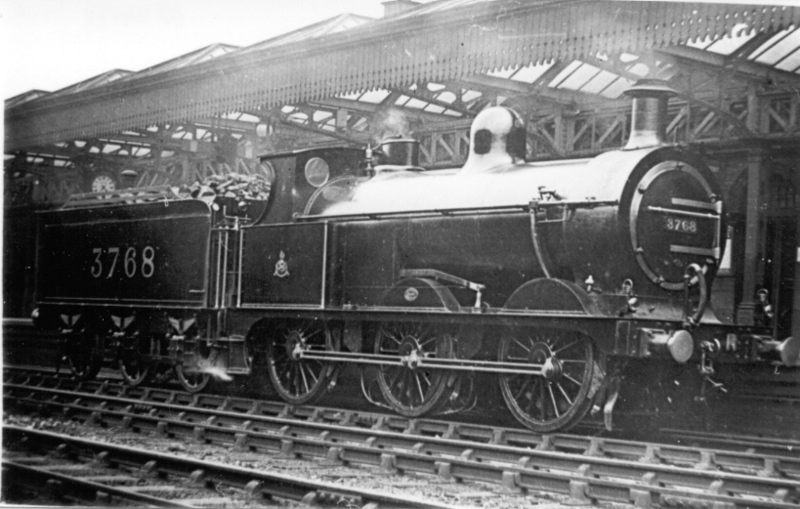 The locomotive was fitted with a saturated G7 boiler in 1928 that was retained for the remainder of its life. The Midland Railway locomotive allocation for 1920 records that the locomotive was allocated to Carlisle Durran Hill and by 1927 it had moved to Derby, Stourton in 1935, Templecombe in 1948 before being withdrawn in 1953. Kirtley 0–6–0 No. 2504 piloting a Class 3 0–6–0 on a stopping goods. 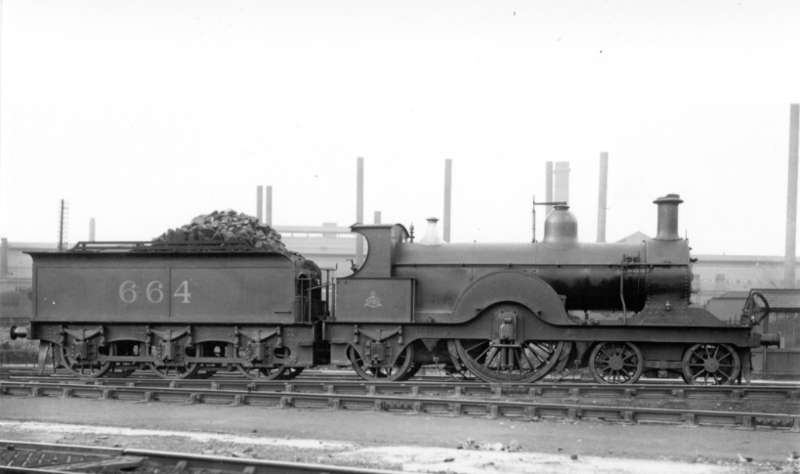 The Kirtley 0–6–0 had been built in 1868 by Dubs and is fitted with a large tender cab. To the right a rebuilt Johnson ‘H’ boiler 4–4–0 No. 469. The truss in the background is the roof of the carriage shed at Hellifield, west of the locomotive shed. The photograph is thought to date from post 1912. Note that 2504 is fitted with steam heating apparatus, which is unusual for a goods locomotive. 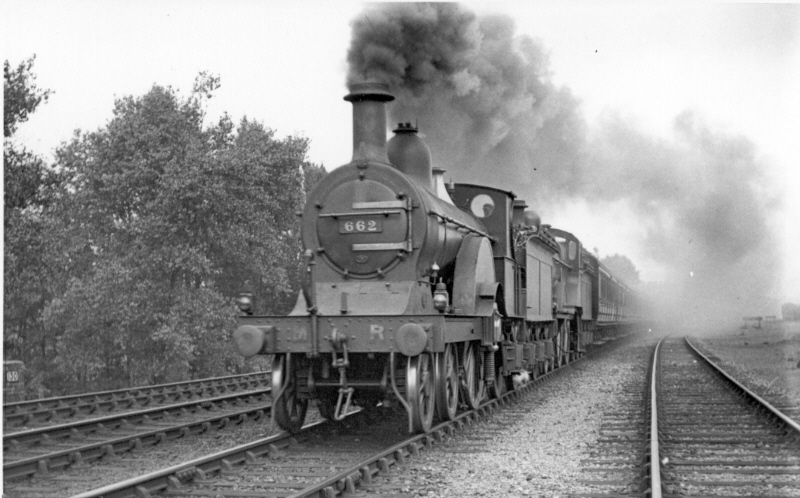 The locomotive was allocated to Wigston shed in 1914 and it is known that on occasions this class of locomotive worked stopping passenger trains between Rugby and Leicester which may explain the steam heating connections. Johnson ‘179’ class single No. 662 piloting a Johnson ‘483’ class on a west of England express at Kings Norton (?) circa 1922. Johnson ‘179’ class single No. 664 on shed at Belle Vue, Manchester. The ‘179’ class was the first on the Midland Railway to be fitted with piston valves when built in 1893. The photograph is thought to have been taken in the ‘Deeley period’. The railway behind the engines is the GCR Manchester to Sheffield (running from west to east) main line beyond which are the their Ashbury’s Sidings. Just to the south was the GCR and MR Joint line from Ashbury Jct. to New Mills. Belle Vue had opened in 1870 and previously to this the MR used the MSLR shed at Gorton and had 15 locos shedded there in December 1869. As the Midland used the MSLR station at London Road and they had opened the large goods depot at nearby Ancoats, Belle Vue was conveniently situated. However the opening of Manchester Central in 1877 and associated nearby sheds (Cornbrook and then Trafford Park) meant that Belle Vue became less important. The engines is probably pictured on the lead in roads to the shed. 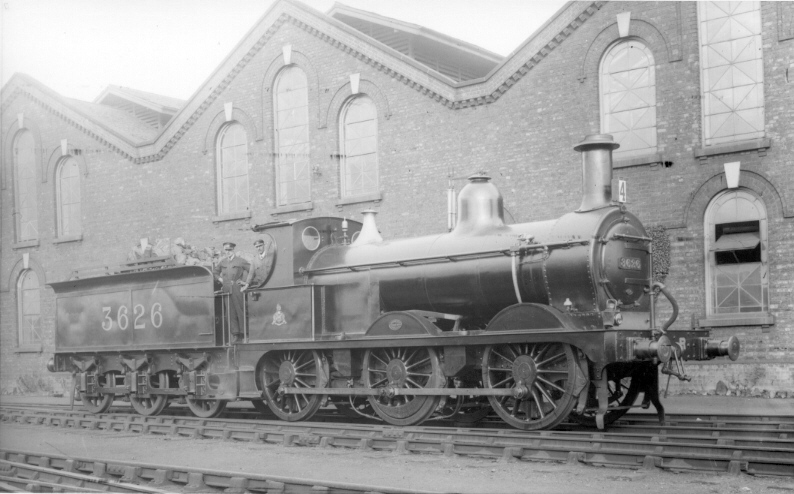 Engine 664 was at Bristol from about 1897 to at least 1921 so its appearance at Manchester is rather surprising. The whole area was dominated by industry and railway facilities. Out of site the left hand side was the Crossley Brothers engine works and beyond the Ashbury works of the Metropolitan Amalgamated Railway Carriage and Wagon Co. Further to the right was the GCR Gorton works and shed and just to the south was the Gorton Foundry of Beyer, Peacock & Co. The ever useful Godfrey Edition of the 25 inch OS “Openshaw” plan of 1908 covers this area. Much of the rest of the district was made up of block after block of terraced housing of almost uniform size interspersed with small factories. Cutting across the plan is Ashton Old Road and amongst the multitude of small traders are noted four engine drivers, some of whom may have worked at Belle Vue. None of the streets has a “Midland” connected name. A little to the south of the shed was a Franciscan Priory (bounded by a chemical works!) that even had a few trees to break up the monotony. Grimesthorpe and Belle Vue were both in highly industrialised locations with steelworks just to the North. 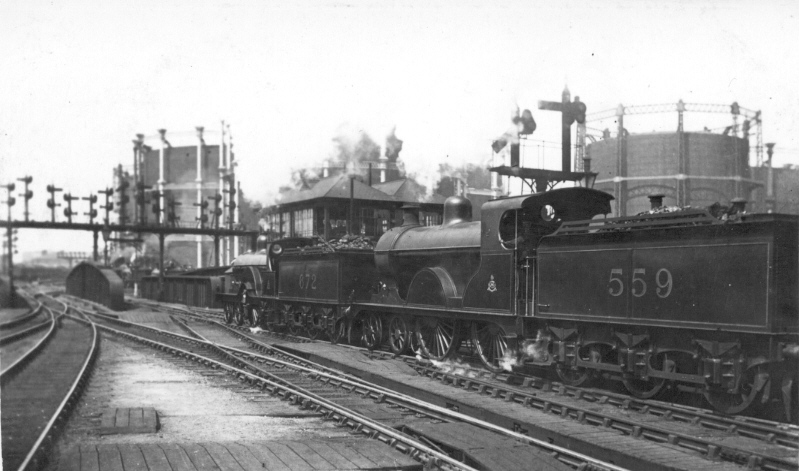 St.Pancras circa 1910 with a down express leaving behind a rebuilt Johnson Class 2 No.559 and a single No.672. St. Pancras Station signal box is behind the pilot locomotive and both locomotives are making liberal use of their steam sanding gear. 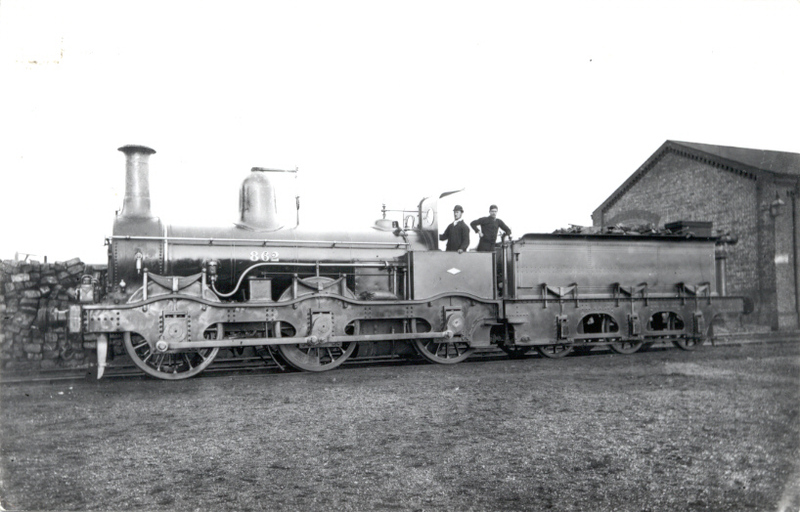 Kirtley 0–6–0 No.862 built by Dubs in 1871. The locomotive retains its original form original form with weatherboard and Kirtley tender. It was re-built in 1885 and 1899 and was lent to the Railway Operating Department between 1917 and 1920 to assist with the war effort. ‘890’ class 2–4–0 No. 899 at Gloucester circa 1905. The locomotive was built to a Kirtley design in 1871 with 6'9" driving wheels and at the time of the photograph has acquired Johnson boiler fittings and smokebox door. Note the covered footbridge to the right of the locomotive linking the Midland and Great Western stations.